When the famously meat-free Impossible Burger first hit the scene in 2016, people were reasonably skeptical. Sure, veggie burgers today taste way better than they did 10 years ago, but a meat-free patty that tastes just like beef? No way. Then word spread that the Impossible Burger actually was delicious, and GASP, "bleeds" and tastes a whole lot like real meat. However, in hopes of getting even more meat-lovers on board with its plant-based offering, the company just unveiled its brand new Impossible Burger 2.0, which is already earning rave reviews for tasting even more like actual beef, with some even finding it indistinguishable from the real deal. 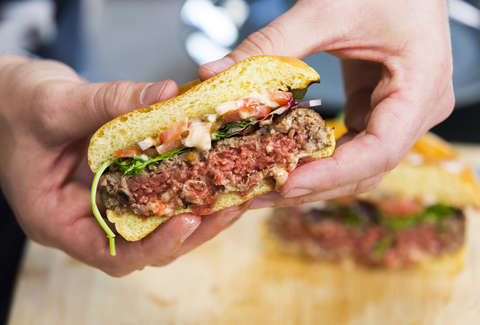 During the Consumer Electronics Showcase in Las Vegas on Monday, Impossible Foods quietly debuted its new Impossible Burger 2.0, which it describes as a slightly tweaked and improved version of the original. And while the new recipe is similar to the original (e.g., it features a genetically engineered and fermented yeast that mimics the flavor of cooked meat), this one contains no gluten, animal hormones, or antibiotics, and is both kosher and halal certified. Thrillist has yet to do a proper taste, but several people who tried it on-site claim it's nearly impossible to tell it's not real animal meat, and an exceptional improvement upon the original. "I couldn't tell it wasn't the real thing," wrote CNET's Dara Kerr, who got a taste of the new offering a few weeks ago. "If the current burger tastes like an OK Sizzler steak, then this new version is a well-massaged Kobe ribeye." Engadget's Nicole Lee agreed, describing it as a huge upgrade over the original. "It was moist and juicy, and the texture was just right. I couldn't believe that this was supposed to be a plant-based substitute," she said. “The newest Impossible Burger delivers everything that matters to hard-core meat lovers, including taste, nutrition and versatility,” said Impossible Foods’ Founder and CEO Dr. Patrick O. Brown in a press release. “This is the plant-based meat that will eliminate the need for animals in the food chain and make the global food system sustainable.” The company also says that the new burger recipe is perfect as a ground beef substitute in everything from meatballs to stews. Impossible Burger 2.0 officially replaces the original version Tuesday, January 8, and will roll out slowly into restaurants and grocery stores. Initially, it'll be available in about a dozen "high-end" restaurants and expand to all Impossible Burger partners by the end of February, according to CNET. They also plan to release a "raw" version in grocery stores by the end of the year, which it claims will be priced similarly to USDA premium ground beef. It's a shame Anthony Bourdain isn't around to give us his thoughts.